Shopping for Deadpool Model Kits? Build a Merc! It's time to make your own Merc, with the first official do-it-yourself model kit of Deadpool. 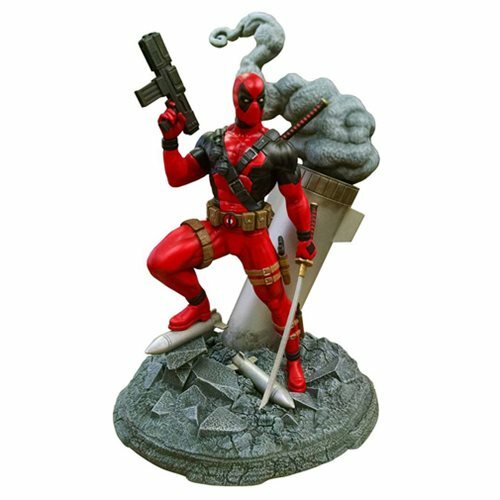 Standing approximately 8-inches tall, this detailed sculpture of Deadpool depicts him standing on a battlefield littered with unexploded bombs, and includes an alternate head so you can display him masked or unmasked. The plastic parts come unpainted. Fans must paint and assemble the merc with glue, which means they decide how the final piece will look! The Deadpool Deluxe Model Kit comes packaged in a full-color box and paint and glue are not included. Ages 14 and up.